Primary hypothyroidism constitutes for thyroid insufficiency in 95% of the cases, and Hashimoto's thyroiditis is the main etiology for primary hypothyroidism. Manifestations of thyroid myopathy include proximal muscle weakness, myalgia, delayed reflexes, and fatigue, but muscle hypertrophy is very rare. The muscular hypertrophy with muscle stiffness is reported in <10% of hypothyroid patients. Hoffmann syndrome is a rare and specific form of hypothyroid myopathy characterized by proximal muscle weakness and pseudohypertrophy of muscles. It presents usually late in the course of disease. The severity of myopathy correlates with the degree and duration of thyroid hormone deficiency. Particularly, in the Indian context, only few cases have been reported in the past. We present the case of a young male with hypothyroidism with long-standing proximal muscle weakness and hypertrophy of calf muscles which receded following thyroid hormone replacement therapy. 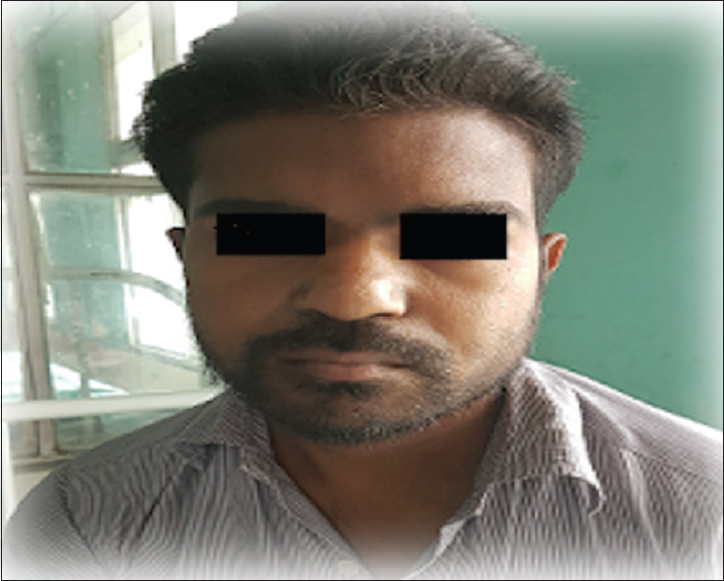 A 35-year-old male, auto driver by profession, presented to our hospital in the last week of May 2017 with insidious onset symmetrical weakness of all four limbs for the past 2 years. Weakness was gradually progressive from easy fatigability to inability in getting up after squatting and lifting heavy objects over a period of 2 years. He also developed painless swelling of both calves for the past 1 year. He also complained of pain in muscles. He did not give any significant history of drug intake. He was able to hold and feel his slippers and perform fine hand movements as well. There was no history of fever or joint pains. There was no history of cold intolerance, weight gain, pedal edema, or diminution of vision. There was no history of chronic medical illness such as diabetes and hypertension. There was no history of similar illness in his siblings. On examination, he was normotensive with a pulse rate of 86/min. He had mild pallor and facial puffiness depicting hypothyroid facies [Figure 1]. All peripheral pulses were palpable. Higher mental function and cranial nerve were normal. Both right and left calf muscles were hypertrophied (36 cm and 39 cm, respectively) [Figure 2]. They were nontender on palpation. Muscle bulk in both the upper limbs was comparable. Power at all joints in all four limbs was Grade 4/5, and tone was normal. There was no calf pain on dorsiflexion at both the ankle joints. Plantar reflex was bilaterally flexor. On eliciting deep tendon reflexes, there was hyporeflexia (+1) along with delayed relaxation of the ankle jerk. There were no involuntary movements seen. Sensory system and bowel bladder function were normal. The systemic examination was normal. Routine laboratory investigations sent on day 1 were normal except mild normocytic normochromic anemia with raised erythrocyte sedimentation rate [Table 1]. At day 2, creatine phosphokinase (CPK) (2368 U/L) and lactate dehydrogenase (LDH) (503 U/L) were raised and thyroid function tests revealed low FT3 (1.58 pg/ml) and FT4 (0.55 ng/dL) and high thyroid-stimulating hormone (TSH) (974 uIU/ml). 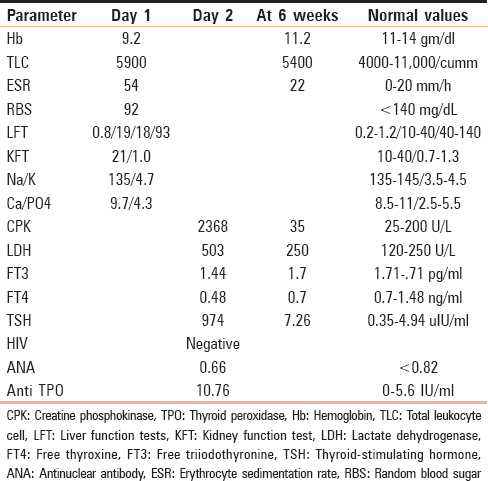 Antithyroid peroxidase (anti-TPO) was positive (10.76 IU/ml). Antinuclear antibody was negative, and HIV was nonreactive [Table 1]. Urine analysis was normal and did not show myoglobinuria. Lipid profile was also normal. Ultrasonography of the neck showed features of atrophic thyroiditis. Chest radiograph, electrocardiogram, and two-dimensional echocardiogram were normal. Venous and arterial Doppler of both the lower limbs was also normal. 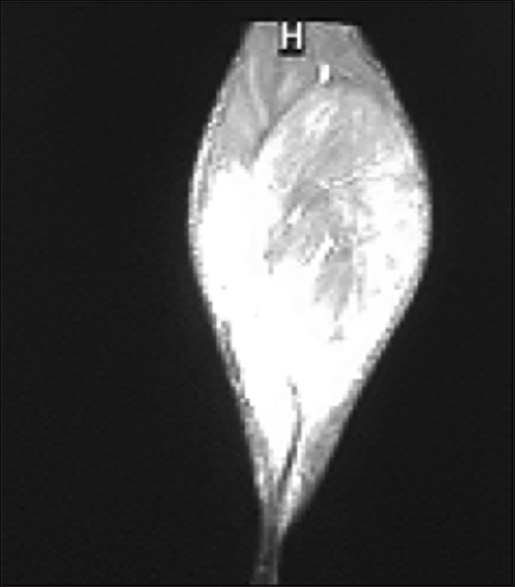 Magnetic resonance imaging of the lower limb showed muscle edema in bilateral posteromedial compartment of thighs and bilateral calf muscles (left more than right) [Figure 3]. Nerve conduction study of all four limbs was normal. Electromyography showed myopathic motor unit action potentials. Muscle biopsy was not done as the patient refused for it. Hence, a diagnosis of hypothyroid myopathy with muscle hypertrophy was made. He was started on 50 μg of levothyroxine daily which was escalated gradually to 100 μg and was discharged thereafter on the same dose. On follow-up 6 weeks later, his symptoms improved and calf muscle bulk regressed to 33 cm and 35 cm in the right and left sides, respectively. TSH and CPK levels also declined [Table 1]. Hoffmann syndrome was first described by Hoffmann in 1897 in an adult who developed muscle stiffness and difficulty in relaxation of muscles after thyroidectomy. Only in 10% of cases of hypothyroidism muscle hypertrophy is seen. Hashimoto's thyroiditis which is characterized by high levels of antithyroid antibodies is the main etiology of hypothyroidism. Our patient had elevated levels of anti-TPO antibodies. Accumulation of glycosaminoglycans leads to increase in connective tissue in the muscles and thus pseudohypertrophy. Chronic thyroid insufficiency leads to change in muscle fibers from fast to slow type that causes weakness and hyporeflexia. Most common muscles to be involved are of the tongue, arms, and legs. Legs were predominantly involved in our case. CPK and LDH levels are elevated in thyroid myopathy due to muscle degeneration. However, they do not correlate with degree of weakness and show a gradual decline over weeks to months with initiation of thyroid replacement therapy, as was seen in our case. The electrophysiological study in hypothyroid myopathy may show findings compatible with neurogenic, myogenic, or a mix of those patterns. Myopathy without other manifestations of hypothyroidism can raise diagnostic dilemmas for clinicians such as Duchenne's and Becker's muscular dystrophies, focal inflammatory myositis, and amyloidosis. In Indian context, only few cases have been reported so far.,,, Thus, this case report emphasizes on simple screening of patients for hypothyroidism who present with myopathy. Scott KR, Simmons Z, Boyer PJ. Hypothyroid myopathy with a strikingly elevated serum creatine kinase level. Muscle Nerve 2002;26:141-4. Deepak S, Harikrishnan, Jayakumar B. Hypothyroidism presenting as Hoffman's syndrome. J Indian Med Assoc 2004;102:41-2. Sidibe EH, Diop AN, Thiam A, Diagne PM, Sarr A, Toure M, et al. A Hoffmann's Syndrome in hypothyroid myopathy. Report of a case in an African. Joint Bone Spine 2001;68:84-5. Larsen PR, Henry MK, Melmed S, Kenneth SP. The thyroid gland. In Williams Textbook of Endocrinology. 11th ed. Philadelphia, PA: W.B. Saunders Company; 2008. p. 325. Ozdag MF, Eroglu E, Ulas UH, Ipekdal I, Odabasi Z, Vural O, et al. Early diagnosis and treatment reverse clinical features in Hoffmann's syndrome due to hypothyroid myophaty: A case report. Acta Neurol Belg 2005;105:212-3. Udayakumar N, Rameshkumar AC, Srinivasan AV. Hoffmann syndrome: Presentation in hypothyroidism. J Postgrad Med 2005;51:332-3. Rudrajit P, Sinha PK, Mondal P, Banerjee AK. Hoffman syndrome as first manifestation of hypothyroidism: A rare case. JK Sci 2011;13:190. Madhu SV, Jain R, Kant S, Prakash V, Kumar V. Myopathy presenting as a sole manifestation of hypothyroidism. J Assoc Physicians India 2010;58:569-70. Chopra BK, Singh G, Puri A. Hoffman's syndrome (hypothyroid myopathy). J Assoc Phys India 1972;20:387-90. Achappa B, Madi D. Hoffmann's syndrome- a rare form of hypothyroid myopathy. J Clin Diagn Res: JCDR 2017;11:OL01-2.